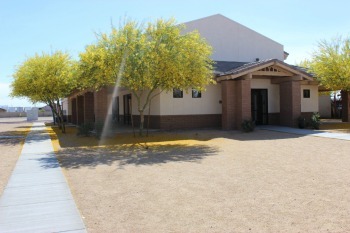 A New Leaf’s East Valley Men’s Center recently began major construction of several areas within the facility, including bathrooms, showers, laundry room and community space. The project continues through the fall and will be completed in January 2018. Temporary facilities have been set up during construction for residents to use. The 94-bed Men’s Center is a critical resource for Valley residents who have experienced homelessness, job loss, financial crisis, or other challenges. A New Leaf provides a continuum of care to help residents with a fresh start, from meals to counseling to job assistance, and more. Once completed, the Men’s Center will provide expanded bathrooms and showers, upgrades to plumbing and ventilation, additional washers and dryers, and a newly painted and modern community space for social functions, classes, group meetings and more.